Clockmaker Pierre Jaquet Droz established his first workshop in 1738 and soon became famous for adding music and automata to his movements. 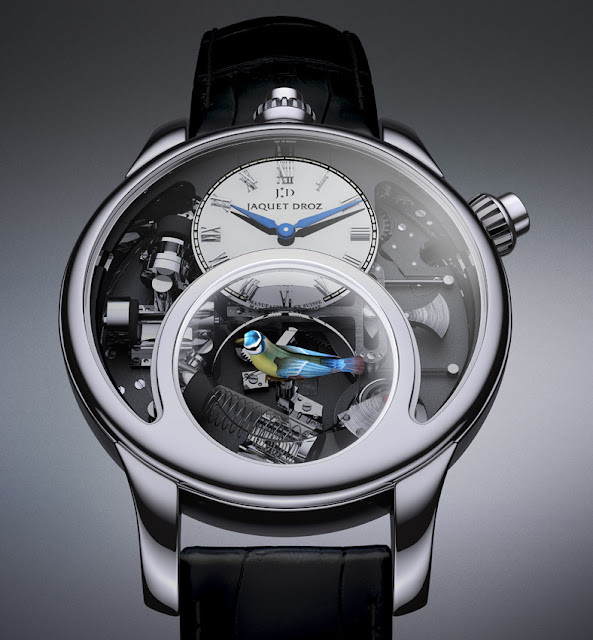 To celebrate this 275th anniversary, Jaquet Droz presents The Charming Bird. After years of research, Jaquet Droz has now combined the automata that first made its reputation in the 18th century with Haute Horlogerie to present a contemporary-looking 47mm-diameter timepiece with a miniature singing bird. Thanks to an intricate mechanism, the bird turns, flaps its wings, moves its head and tail, and opens its beak to chirp. 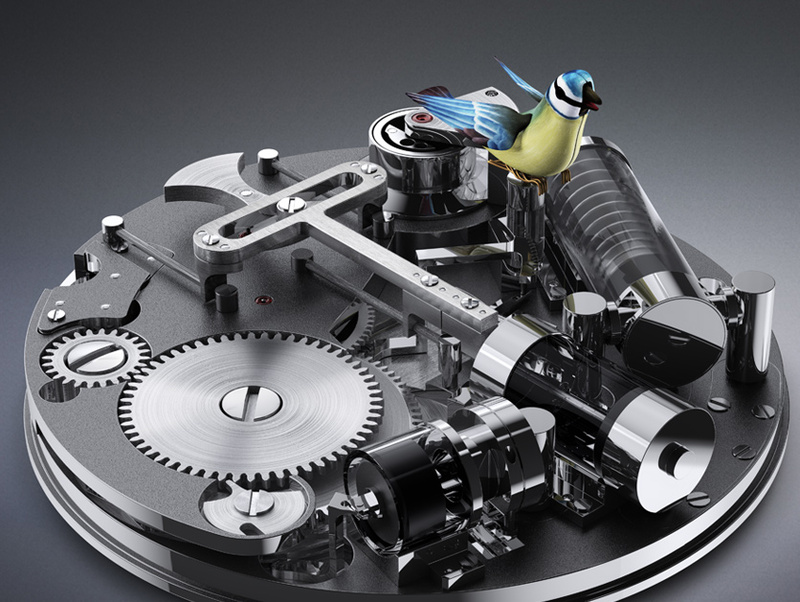 In The Charming Bird, the Jaquet Droz craftsmen have succeeded creating a singing automaton by developing a piston-driven bellows system and miniaturising the techniques inherited from the 18th century. In contrast with the complexity of this model, Jaquet Droz has opted for a case of great simplicity. The case is made of white gold and combines a sober design with a dome-shaped sapphire crystal specially conceived to enhance the effect of light passing through it. The hand wound movement beats at 21,600 vibrations per hour and offers 40 hours of power reserve. The Charming Bird will be produced in a limited edition of 28 pieces. 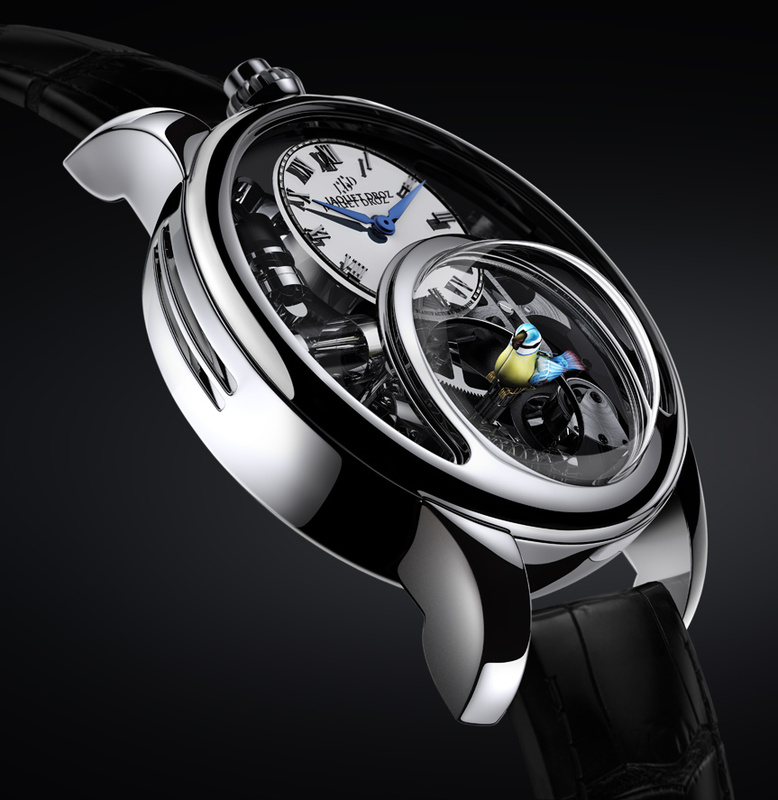 To celebrate this 275th anniversary, Jaquet Droz presents The Charming Bird. After years of research, Jaquet Droz has now combined the automata that first made its reputation in the 18th century with Haute Horlogerie.